The Equipment Data Acquisition (EDA, also known as Interface A) standards are a collection of SEMI standards intended to facilitate and improve communication between a factory's data gathering software applications and the factory equipment. The factory uses EDA to collect specific data from equipment, and then analyze that data to determine how best to increase productivity, improve product quality, and reduce costs. EDA does not replace the SEMI GEM/SECS standards or the SEMI GEM300 standards, since EDA does not provide any features for equipment control or configuration. Instead, equipment suppliers support EDA in addition to other required interfaces to provide flexible, high-performance data collection capabilities. As early as 2010, IC makers started requiring integrated EDA solutions from the equipment suppliers. Since then, the demand has continued to increase as IC makers realize the manufacturing benefits of analyzing detailed equipment and process data. Cimetrix was at the forefront of the EDA/Interface A standards development from the beginning, and remains dedicated to the evolution and use of these standards. We collaborated with SEMATECH to develop the EDA Equipment Client Connection Emulator to support Freeze Version I (1105), and then for Freeze Version II (0710). 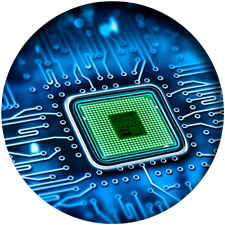 Today, Cimetrix offers ECCE Plus, which supports both versions of the EDA standards. Both equipment and factory client applications implement interfaces via web services using SOAP/XML messages over HTTP or HTTPS connections, and those interfaces must comply with the specific SOAP/XML implementations standards E120.1, E125.1, E132.1, and E134.1. Initially, each client must establish an authenticated session. Next, the client can ask for the Equipment Model metadata (for an in-depth look at this topic, please view the video "Equipment Modeling: E120/E125") information to see how the metadata model represents the data that can be collected through an EDA interface. The equipment generates and sends Data Collection Reports to the client until the client deactivates the plans or becomes unavailable. When shutting down properly, the client should close the session. 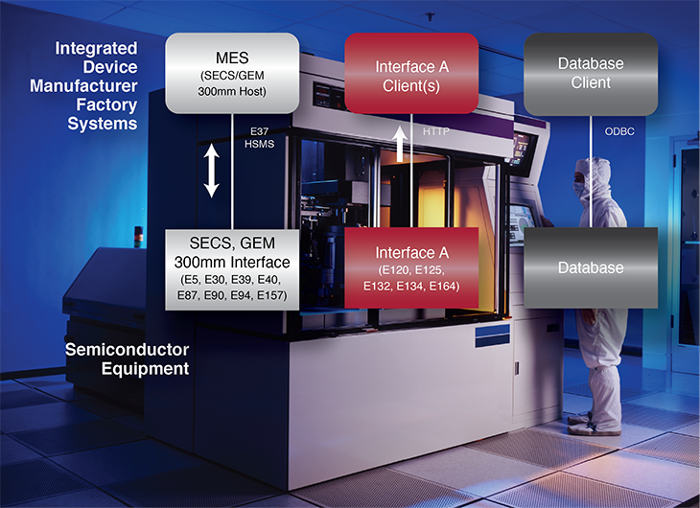 Because the EDA standards continue to evolve and change, SEMI and its member companies initiated the concept of “freeze versions.” Each freeze identifies a specific version of the individual EDA standards that equipment suppliers and IC makers use as a unified set to implement the interface. SEMI implemented the freeze version concept by creating two downloadable bundles of standard schema files: one for the 1105 freeze version, and another for the 0710 freeze version. These are available on the SEMI website. Unless the client and equipment are implementing the same version of the EDA standards, they cannot fully communicate and might be incompatible. This is the nature of SOAP/XML web services technology. The latest version is Freeze Version II (0710), and is the one required by all fabs for new equipment. Access Control List (ACL) Part of E132, the Client Authorization details that grant or deny Client sessions and impose restrictions on Clients access to specific EDA information and operations. Client Consumer An EDA Client that receives the Data Collection Reports and other E134 consumer operations. Data Collection Plan (DCP) Part of E134, a data gathering request that includes a set of Event Requests (with a configurable set of Parameters), Exception Requests (with a fixed set of Parameters), and Trace Requests (with a configurable set of Parameters). After a Data Collection Plan has successfully been created, it must be activated. Then the Client will receive the respective Data Collection Reports as configured in the plan. Data Collection Report (DCR) The Equipment sends the requested data in this standard format, defined in E134. 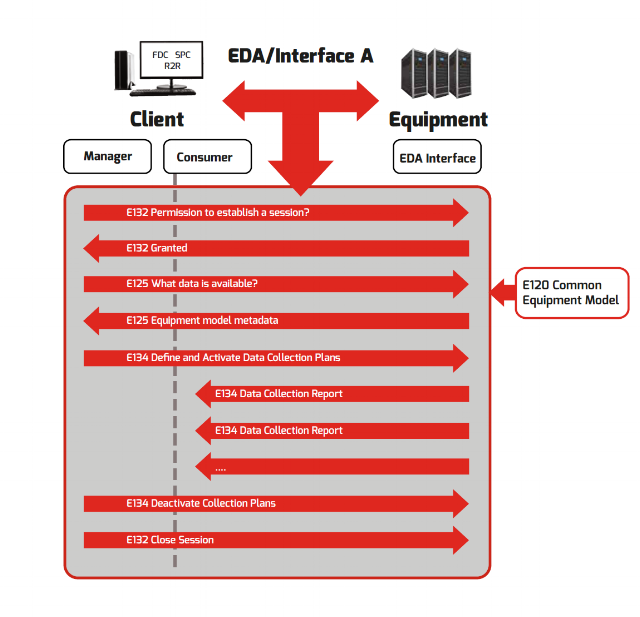 EDA Equipment Data Acquisition, also known as Interface A. The combination of SEMI standards E120, E121, E125, E128, E132, E134, E138, and E164. Equipment Equipment refers to the hardware and software received from equipment suppliers to perform work for the IC maker. In the context of EDA, Equipment refers to the EDA Server that represents the hardware and software to the Clients. Host The software an IC maker runs to communicate with the Equipment. A Host typically refers to the SECS/GEM connection, but could also refer to a Client application using EDA. Metadata Information that describes the data, such as when an Event occurs or the interpretation of a Parameter's value. Operation An EDA transaction, method, or message initiated by an EDA client or server. Each operation has a name, well-defined format, and meaning. E125, E132, and E134 each define a set of operations for the client and server. Parameters The set of data available for gathering from the Equipment's EDA/Interface A connection. Session Also called an Authenticated Session, a Session is established between the Server and Client by following the E132 procedures. Once a Session is established, the Client can send authorized operation messages. SOAP Simple Object Access Protocol (SOAP): To make the EDA/Interface A standards easier to implement, they use the SOAP protocol. It is a lightweight, XML-based protocol for exchange of information in a decentralized, distributed environment. See www.w3.org/TR/2000/NOTE-SOAP-20000508 for more information. The SEMI E164 standard, approved in July 2012, provides a single, agreed, interpretation of the various SEMI standards as represented in a common metadata definition, which will help drive consistency in how equipment suppliers implement the EDA standards. The Common Metadata will help remove some of the uncertainty that may have prevented many companies from developing factory client applications that can use the EDA data produced by the equipment. For an in-depth look at this topic, please view the video "E164 - EDA Common Metadata"). To test the compliance of a specific interface implementation to the EDA standards using the industry-accepted methodology for this process, both suppliers and customers of manufacturing equipment can use the Cimetrix EDATester product. This product also tests the performance of the interface. To test the conformance of the equipment’s metadata model to the E164 standard, download and use the EDA 0710 freeze version (Metadata Conformance Analyzer V1.2) of the MCA. The required input files for the MCA can be generated directly by both the ECCE Plus and the EDATester.